It is interesting to study the contrast between the handling of the Toyota accelerator problems, which turned out to be pretty much all driver error, and the Chevy Volt fire issues. In the case of the former, we had public hearings and government threats. The government, without evidence at that point, demanded Toyota recall the vehicles and stop production. Eventually, when the NHTSA determined that the panic and recall was in error and the issue was operator error and not with the car, the Obama Administration suppressed the results. It now appears the fire hazard was first discovered back in June, when GM first heard about a fire in a Volt that occurred some three weeks after the vehicle had been crash tested. Yet, almost five months went by before either GM or the US National Highway Traffic Safety Administration (NHTSA) told dealers and customers about the potential risks and urged them to drain the battery pack as soon as possible after an accident. Part of the reason for delaying the disclosure was the “fragility of Volt sales” up until that point, according to Joan Claybrook, a former administrator at NHTSA. Demagoguing a non-problem in the first case, covering up a real problem in the second. Guess which one has a union that supported Obama's election and which does not. Guess which one Obama bought equity in with taxpayer money? The stakes are high: The French automaker, now partnered with Nissan, is betting its future on the popularity of the electric vehicle. It plans to introduce no fewer than three electric cars in Europe this year: a sedan, a light commercial vehicle, and a city car. Unless the espionage thwarts its plans, Renault's gamble is probably a good one. Also last week, the judges of the Detroit auto show gave all their top awards to EVs and hybrids — proof, according the Guardian, that "analysts [are] bet[ting] on rising oil prices and wider acceptance of electric cars." Nissan's Leaf took second place to the Chevy Volt. As I wrote in the comments, electric cars are a huge opportunity - there are tens of billions of dollars of corporate welfare from countries around the world to be captured. When it is the Left that is actively supporting huge transfers of funds from taxpayers to large corporations, that is an unprecedented rent-seeking opportunity that European companies, already well-schooled in how to be successful within a corporate state, are sure to avidly pursue. Not since corn ethanol has there been a similar gold-rush for taxpayer funds. We often, though sometimes incorrectly, assume that it's cheaper to operate an electric vehicle than a comparable gasoline auto. Hey, who hasn't? While this assumption generally holds true, electrical rates vary widely across the nation and can throw off the numbers. In some instances, like when Inside Line's engineering editor, Jason Kavanagh, drove the Chevrolet Volt out in sunny California, one discovers that operating a vehicle powered by electricity can indeed cost more than running it with the liquid fuel that pours from a pump. Earlier, I took down the absurd initial advertising that the Volt got 230 MPG. 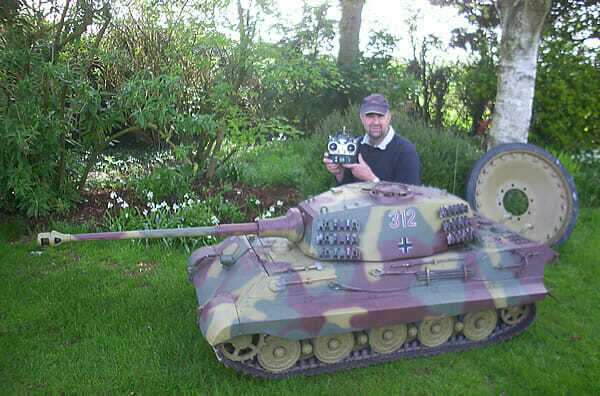 These guys sell a 1/4-scale RC King Tiger tank, perfect for tearing around the neighborhood. Six feet long, nearly 600 pounds. Uses electric motor rather than gasoline, which seems odd to me -- probably takes more juice to recharge it than a Chevy Volt (and that's OK). This would almost be wasted here in Arizona, where people would just think it was cool. I would have to take it back to Cambridge to have any real fun. (Yes, your neighbor can get a T-34/85 if they feel the need to respond). One of the great things about the web, obviously, is that it allows for much more efficient communication that opens up new and useful offerings. For example: the web offers the ability to find other people traveling to the same general place you're heading and to set up a convenient carpool. It's good for the environment. It's good for traffic. It just makes a lot of sense. Unless, of course, you're a bus company and you're so afraid that people will use such a system rather than paying to take the bus. That's what happened up in Ontario, as earlier this year we wrote about a bus company that was trying to shut down PickupPal, an online carpooling service, or being an unregulated transportation company. TechCrunch points us to the news that the Ontario transportation board has sided with the bus company and fined PickupPal. It's also established a bunch of draconian rules that any user in Ontario must follow if it uses the service -- including no crossing of municipal boundaries -- meaning the service is only good within any particular city's limits.